You know, I'm in split minds about New Years resolutions. Yes, I do believe that possibly they are a way of setting yourself up for failure. However, last year, with the help of my very talented friend, Caryl Hart, I found out the value of writing a business plan. Huh? Well, in some ways, a business plan and New Years resolutions are pretty similar. Anyway, I thought I'd go ahead and set out a few drawing aims for the year. One of those aims is to go in search of my perfect Mod drawing. The 1960s are my absolute favourite time in history. I'm always inspired by the Mod movement. My love of it started when I was a kid, watching old 60s British black and white films and grew deeper through my father's record collection. The style, the clothes, the music, the art, I love everything about it. So I want to make a special drawing that reflects that. 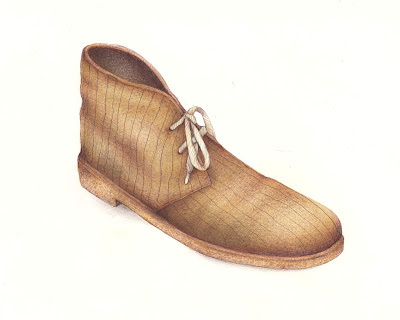 What does all that have to do with desert boots? Well, for those not in the know, they were part of the uniform of any self respecting young Mod. So, that's one of my drawing resolutions for the year. I'll be setting out the rest, post by post, over the next couple of weeks. LOVE the shoes...and the idea. I didn't know it but I think Edgar may be a little mod...he bought shoes very similar to this while in Amsterdam. We call them his 'dutchies'. BTW, congrats on your shoe sketch purchase and shoe purchase! Fantastic idea. I thought I was MOD! Desert boots, not so much. Combat boots - yes. Look forward to seeing more - and congrats on the purchase of the shoes!!! Congratulations on getting those shoes! This is a fabulous sketch, I look forward to learning more about the Mod Movement from you! Fantastic boot! I want to reach out and pick it up. Awesome shoes! You have such a delicate touch to all of your drawings, they should all be posted on Etsy or flickr so someone famous can hire you to do ads, or the very least, get you the money to buy more shoes!!! Groovy boots and I have a pair! Ok I admit it I am a shoe whore too. Love your drawings and your sense of humour. Veru interestings!!! ;) I am totally agree with you! Retro style- is one of the best! Beautiful drawing. Now let's see the multi-mirrored scooter sketch! Always a joy to see and read what you are up to. I always knew that if I just kept them long enough.. now where did I put those shoes? Wonderful colored pencil style. Anonova, I forgot about Mod Wolves! Thank you for reminding me. It's fab, and I've just emailed it to my niece. Who has a massive crush on Vince. I'm more of a Howard girl, myself. Anthony, the multi mirrored drawing is defineitley on the cards. Already started a few sketches. Like the idea you have there. I'm quite new to blogging, and at the moment I'm not sure as to how you create links from one blogger to another. I have put you blog in my links section, and was wondering whether you may also want to put mine in yours? Have a look anyhow, and see what you think! Looking forward to the next drawing! Oh hello again to the 60s. I think I was the first to wear dyed blue stockings in Melbourne even earlier than that - perhaps 56. But I wasn't a beatnik,just took off in 61 for Fiji as an adventurer, painted here and there. I had a pair of these when I was a kid. Oh my, did they ever hurt my feet (they were a little bit too small), but they were over-the-top cool! fabulous shoes! I realise I have missed so many of your posts and have now found out why! Your rss feed mysteriously disappeared from my 'bloglines' thingy! Phew - all sorted now! You mean like in MOD SQUAD! Could not stand that show. However, I did have one of the cutest Pant Suits that's Top was just long enough in case I needed a dress and the pants had to disappear in public. Starlets were not the only ones to do that. I also had a fab wrap skirt- it was light denim material in rich dark green and the opposite side was wonderful Paisley Print and I had a solid really nice blouse and a Printed Pararie Blouse to wear with the skirt. Opps! I wore the Paisley side of the skirt with the print blouse to the movie's. I thought my oldest sister was going to have a stroke. No print with opposite type print- The seams did not match. Have fun. I just voted in an Historic Vote IN Masschusetts for the Senate Seat! No dogs to sniff for bombs- no guard but a lone security guard - We were at one of our finest High Schools --- God Bless America. I am Happy! Mod away!!!! Lord help me, I lived in boots like this for about ten years. love your work and have been watching it for years. can you explain how you work? do you outline the item and then fill the outline in w/ your crosshatches or do you work just from the crosshatches toward making them into a picture? if you don't want to answer here, you can always email me at jacks_friend_jill@yahoo.com . thanks!!! Jill, hmmmm. I always find it so difficult to explain what I do. I'm not sure that I even know how I do it! I definitley would put an outline in, though. That'll always be where I start. Then I just cross hatch the outline space. I let the cross hatching lead the way - if that makes any sense? Obviously, I have the subject (usually draw from life) to refer to but somehow the hatching tells me what to do. Sorry if that's vague, I really am rubbish with words - that's why I draw!! Next one would be 'Zales' online thomas jewellery store. Just as stunning as shopadf offering even thomas sabo uk online shop more and with more offers. You can see large discounts buy thomas sabo online here in Zales. They have rings, necklaces thomas sabo charms, bracelets and watches. There is a dedicated thomas sabo charms cheap section for men as well. They work in gold, silver cheap thomas sabo charms and even gemstones but not charm bracelet charms much of platinum's and diamonds. There is charms thomas sabo a clearance section which will notify sterling silver charms about any clearance going on. In short silver charms this store is extremely wonderful.